As the name suggests, the Field of Mars (Rome's god of war) has a military heritage. Originally the parade ground of the cadets at L'Ecole Militaire, the Champ de Mars has seen some of the best military men in history march upon it. One of those was a young Corsican named Napoleone Buonaparte. 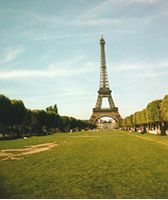 Today it is used by Parisians as a place to relax.